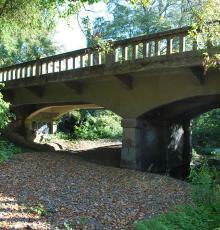 The Nokomis Avenue Bridge over San Anselmo Creek was built in 1930. The existing four span bridge carries two narrow lanes of traffic and is supported by concrete abutments at each end of the bridge. The existing sidewalks on the bridge are narrow and do not comply with Americans with Disabilities Act (ADA) requirements. 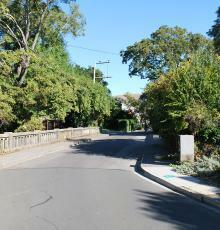 Nokomis Avenue is an urban local roadway providing connectivity for neighborhood residents to the surrounding community and Sir Francis Drake Boulevard, a primary thoroughfare providing access into downtown San Anselmo and the greater North Bay area. The bridge has been identified as Functionally Obsolete by Caltrans. Additionally, the bridge’s narrow width makes the bridge eligible for replacement under the Federal Highway Administration’s Highway Bridge Program (HBP). Additional information about the HBP can be found at this link. The bridge is also a contributing factor to flooding in the area and has been identified as a priority for removal as part of the Ross Valley Flood Control Program for 100 Year Flood Protection. Throughout all phases of the project, measures will be implemented to minimize impacts to local residents and address environmental impacts to the resources of San Anselmo Creek. Bridge replacement activities will require the closure of Nokomis Avenue within the immediate vicinity of the project site. The Madrone Avenue bridge, located just south of the Nokomis Avenue Bridge site, will also be replaced at the same time under the same program and that road will also be closed. However, residents are expected to continue having full north and south access to Sir Francis Drake Boulevard via Madrone Avenue (to the south) and Sais Avenue (to the north). Frequently Asked Questions about the project can be found here. The Nokomis Avenue Bridge is supported by concrete abutments at each end of the bridge. The existing sidewalks on the bridge are narrow and do not comply with Americans with Disabilities Act (ADA) requirements.